We all love a soak in a powerful modern hot tub with massaging jets and comfortable contoured seating, however, it’s easy to forget how far hot tubs have actually come. Portable spas have been evolving and have come a long way since the first people stepped into natural warm springs for a soak. To show our appreciation for the advances in spa technology and the evolution of the modern hot tub, below is a look at hot tubs and hydrotherapy throughout history – homage to where it all started and where we stand now. Naturally occurring hot springs are the first known hot tubs on record. As far back as history can record, humans have utilized hot springs for both recreational relaxing and also for their natural healing properties. In the early years of civilization people are believed to have flocked to these hot springs for medicinal purposes, rituals of healing, and aquatic therapy, often attributing great spiritual, magical, and mythical powers to the warm waters due to their amazing influence on those who bathed in them. Dating as far back as 2000 BC, ancient Egyptians were amongst the first to widely adopt the power of the hot tub for its therapeutic values. In fact, Phraortes, the King of Media, built one of the first known hot tubs in 600 BC, which simply consisted of a water-filled caldera that was then heated by placing red-hot stones in the water. It may come as no surprise to find that the wisest men in history found great inspiration in hot tubs. Yes, legendary Greek philosophers, such as Plato and Hippocrates, also noted the therapeutic properties of warm water as far back as 400 BC – a time when the Greeks were known to have built structures around hot springs to create an indoor spa of sorts. Modern science of course is just now catching up to what these ancient thinkers knew about the cognitive, social, and emotional benefits of hot water therapy. Much like the Greeks, the Romans constructed enormous bathing complexes around natural hot springs in second century AD to satisfy the tubbing or bathing trend that was triggered by the advent of the aqueducts. In fact, the fad was so prevalent that there were private baths in the home for the first time but also public bathhouses that were run by the state and offered a capacity for thousands of people at once. 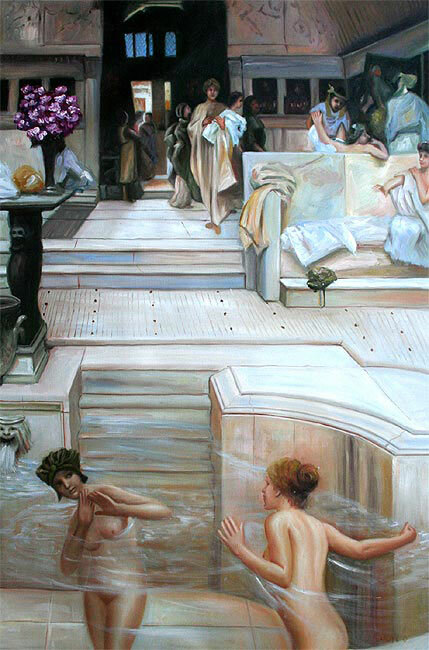 These public hot tubs became the most important gathering places in Roman society. Today’s paparazzi would have had a field day at these gatherings of the who’s who in Roman society. The Japanese have a long history of discovering alternatives to traditional medicine and healing. The Japanese believed so much in the healing power of water that popular bathhouses, equivalent to a modern day resort and casino, became prevalent and very popular around 737 AD. These establishments offered fine foods, lodging, Zen gardens and indoor/outdoor soaking tubs. These hot tub destinations were a big part of the social scene in much of Asia and, in fact, spas with hydrotherapy continue to be popular gathering places in Japan today. 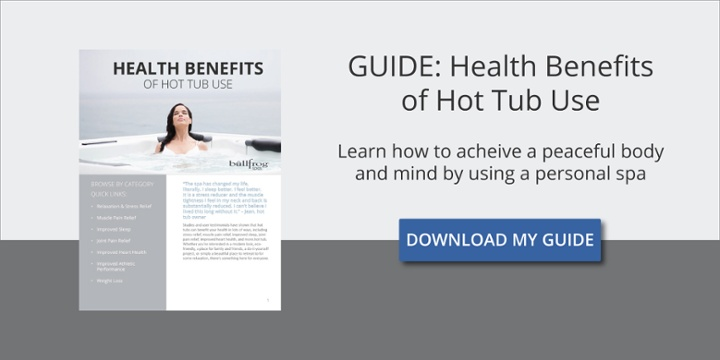 Due to the epidemics like Bubonic Plague and other disease in the Dark Ages, hot tubs drastically declined in popularity for a couple of centuries. Misinformation about disease and poor hygenic practices actually fueled these epidemics and the plague, other infections, a somber general depression and well, death became part of everyday life. Most people in the Dark Ages only bathed themselves twice a year, in the Spring and the Fall, contributing to their likelihood of contracting infections. With the Renaissance came a rebirth in thought and art. Hydrotherapy in large ornate hot spring baths began to again regain their mainstream popularity because of their undeniable healing power. Many of these locations are still in use today. Science developed quickly during these years and soaking in hot water became known as hydrotherapy. Because of the beneficial effects of these treatments, doctors would simply prescribe a soak in a hot tub – certain temperatures for certain ailments. With this new found faith in the science of soaking, hot tubs were back and both European and American cultures began building entire resorts and hotels around the long-lost hot tub. Now that hot tubs were back in good graces with the public and the industrial revolution had allowed technology to progress like never before, the first true hot tubs as we know them today were built in the mid-1900s using olive tanks, wine tanks and water troughs … and the rest is history. The first home hot tubs began to appear in the 40s, mostly in California. These early at-home spas were inspired by the Japanese ofuru style. Eventually redwood and cedar hot tubs began to appear in homes, mostly built by the home owner. These tubs proved to be a maintenance nightmare because the wood needed constant care to remain water tight. In 1956, the Jacuzzi brothers invented a portable pump (J-300) that aimed to alleviate arthritis through hydrotherapy. Although the Jacuzzi pump was sold to hospitals and schools for hydrotherapy, it remained largely a small niche business until the 60s. In 1968, hot tubs took another step forward due largely to a third-generation Jacuzzi family member, Roy Jacuzzi. Hot tubs began to be developed with pumped water and jets embedded into the sides of the tub. These were more like today’s jetted bath tubs, but in response to the growing demand for at-home health and leisure products, hot tubs began to be sold directly to home owners. By the 70s, wooden hot tubs had outdated themselves in the mainstream and manufacturers switched to a fiberglass spa shell due to the ease of manufacture, durability, and weight. Better acrylic spa shells soon followed but took some time to perfect. It was at this time that hot tub makers began installing pumps, filters, control systems and jets to create an easily maintained home hot tub that would quickly become the at-home leisure and therapy activity of choice from the 1970s to today. Because of the growing popularity of hot tubs, David Ludlow convinced his father to start selling them through the family pool business. Sales were good and David was put in charge of service calls. Fixing spas becames a frequent reality and the first beginnings of an idea for a better hot tub plumbing design came to Dave one night. After attending a pool and spa show and seeing the mazes of complex plumbing underneath these spas and the inadequacies of these designs, the concept for what would become the JetPak System is first scribbled out on paper during a sleepless night in 1989. Having perfected and patented the JetPak System, which utilizes modular spa seats and a more efficient, virtually leak-proof design, David Ludlow forms Bullfrog Spas. Bullfrog Spas revolutionize the reliability and customization options available on modern spas. Much like computers are now personalized to your favorite settings and options, hydrotherapy in a Bullfrog Spa can now be customized to fit your specific needs. Hydrotherapy has been proven to be an important part of the greatest cultures and societies. It’s been a long road since the first humans jumped in warm natural springs and found out it feels good to where we are today. Today’s modern hot tubs feature the ultra-advanced JetPak Therapy System that provides personalized hydrotherapy for every spa user. All along the way people have relaxed, said “Ahhhhhh,” and felt their stresses and pains melt away. Today science is proving that warm water therapy is good for the nervous system, good for the heart, beneficial to those with ailments like diabetes and arthritis, helpful in decreasing stress and improving mental health, helpful in promoting better sleep and is an important part of maintaining an overall healthy lifestyle. Discover hydrotherapy for your own lifestyle and see what the centuries have proven to be so good for you and your health. Jake Ricks is the Senior Marketing Manager for Bullfrog Spas. Jake has been published in a variety of publications with topics that include the pool and spa industry, outdoors, digital marketing, and content marketing. Jake's passion is fly fishing and living life outside. He guides, competes in fly fishing events, designs fly patterns and is a regular contributor to outdoor blogs and periodicals.